The Eurasian Collared-Dove was inadvertently introduced into the Bahamas in the mid-1970s. It naturally spread to Florida and is now established throughout the southeastern United States. Its breeding range in North America continues to expand north and west. The first nesting record in Tennessee occurred in May 1994 in Shelby County, and as of 2008 Eurasian Collared-Doves have been recorded in 80 of the 95 Tennessee counties. The success of the Eurasian Collared-Dove can be attributed to the wide availability of seed offered by backyard bird feeders, grain in agricultural areas, and tolerance of human activities. Description: Larger than a Mourning Dove, the Eurasian Collared-Dove is pale sandy gray with a pinkish hue on the head and breast when observed in good light. There is a narrow black half-collar on the back of the neck (not always visible). The wings are mottled gray with dark primaries, and the tail is long and square. The under-tail pattern is black near the base with a broad white terminal edge. Both sexes look alike. Voice: The song is a three-notes coo-coo-coo, with the first note quickly followed by a second, longer note, then a short pause before the final short note. They also give a musical growl in flight. Mourning Doves have a long pointed tail with white outer tail feathers, and only a spot, rather than a collar, on the neck. Habitat: Found in urban, suburban, and agricultural areas where grain is available. Diet: Seeds and cereal grain, some insects. Nesting and reproduction: The Eurasian Collared-Dove primarily nests from February through May, but may nest at any time of year. Incubation: Both parents incubate the eggs for 14 to 16 days. Fledging: The young are fed "crop milk," a nutritious fluid produced by both parents, and seeds as the young mature. The young leave the nest at about 18 days old. Nest: The female usually builds the nest with the male gathering nest material. The nest is made of twigs, stems, roots, and grasses and usually placed in trees, often near human habitation. 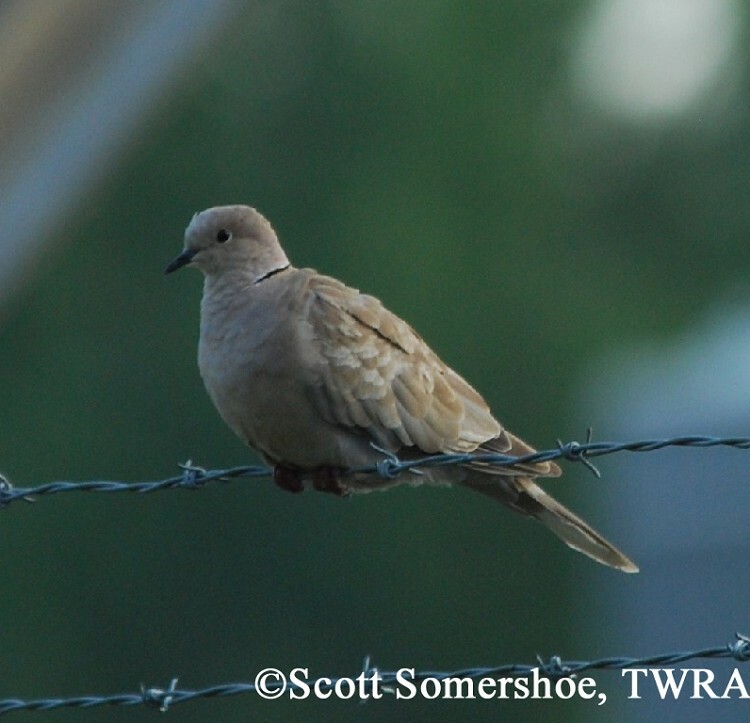 Status in Tennessee: Eurasian Collared-Doves are currently uncommon statewide in metropolitan areas, small towns, and agricultural areas. They only recently arrived in the state and as of December 2008, had been observed in 80 of the 95 Tennessee counties. The 15 counties where the species has not been reported are: Campbell, Cheatham, Cocke, Hancock, Jackson, Johnson, Morgan, Scott, Sevier, Smith, Sullivan, Trousdale, Unicoi, Union, and Van Buren. Eurasian Collared-Doves are usually found in small groups, but on occasion, in large concentrations where food is abundant. In 2007, 3,000 were observed from one location in Memphis, but numbers over a dozen are uncommon. The 2007-2008 the Tennessee Christmas Bird Count reported 526 individuals on 12 counts statewide. In August 2008, 169 were seen flying from a roost in Smyrna, Rutherford Co. 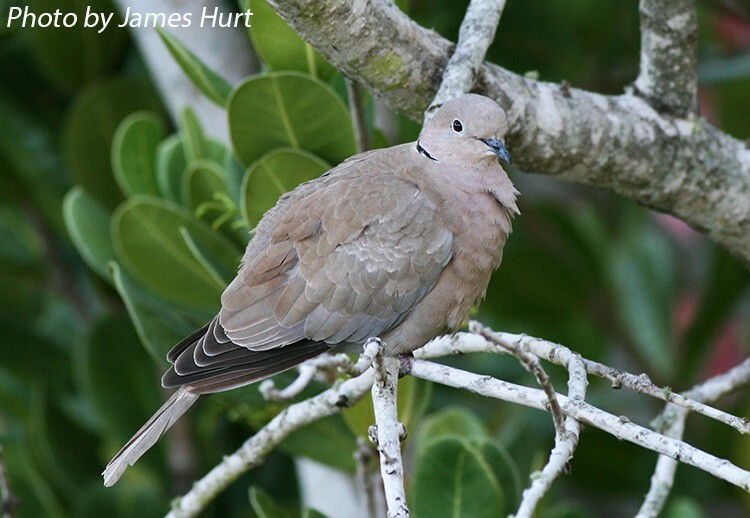 Introduced into the Bahamas in the mid-1970s, the Eurasian Collared-Dove is now established throughout the southeastern United States and has been seen across the continent. Its spread across North America is still an evolving story, and the extent of its final range and the impact it will have on other bird species remains to be seen. Best places to see in Tennessee: Farms with grain silos, cemeteries, and residential areas, especially in West Tennessee. Robinson J. C. 1990. An Annotated Checklist of the Birds of Tennessee. Univ.